As sweet as an ice cream sundae, with tight harmonies as dense as a pound cake, the wonderful performances in the Dio’s production of FOREVER PLAID serve as the cherry on top. Walking in to the show all I knew was that it was a review of songs from the era before rock and roll. Little did I know there is a hilarious and enjoyable story attached as well. A quartet of male “teen angels” are brought back to earth after having been taken too soon, so that they can fulfill their dream of performing one last show. One by one, each character reveals himself and is given a moment in the spotlight. And one by one, I fell in love with every one of them. James Fischer as Sparky is a master of comic timing, newcomer Angel Velasco’s Jinx is the picture of delightful innocence, Matthew Wallace as Smudge is a loveable goofball, while holding them all together, almost like a big brother, is Steve DeBruyne’s Franky. DeBruyne’s direction made the evening seamless and I may have noticed some succulent touches that could have only come from the warped imagination of Assistant Director Dan Morrison. The tightly choreographed moves by Bryana Hall look like they are right out of any real-life 60’s boy-group and the actors carry it off very well. Norma Polk’s costume design looks snappy, and Matthew Tomich does super work with the sound, lighting and projections. Eileen Obradovich’s prop design works particularly well in the Ed Sullivan sequence. Mix in two musicians (Brian Rose on piano who also has done very good work as Musical Director, and Leer Sobie on bass) and you have a refreshing milkshake blended to perfection. There is a reason the Dio returns to this show time after time and you would never know that this incarnation was a last-minute replacement for a different show. The food by chef Jarod was wonderful as always (the fried chicken alone is worth the price of admission). All in all, this is the perfect escape from the summer heat. The Dio Theatre has a holiday-cheer filled reprise of its own “Home For the Holidays” in store for this season. It looks and sound terrific and everything zips along fast and efficiently. Only a Scrooge wouldn’t have fun at this Christmas delight. During a Christmas Eve performance, diva Portia (Molly Cunningham) refuses to go on stage when she finds husband Eric (Matthew Pecek) won’t be home from the Army for the Holidays. Forget the story, its just an excuse for some lovely holiday pop standards, Cunningham sounds remarkable on “Where Are You Christmas” and Pecek soars on “I’ll be Home for Christmas”. The show resembles one of those old 60’s or 70’s tv-scripted holiday specials with just enough plot to lead to laughs, while firmly focusing on the holiday cheer and music. The ensemble cast this year is tight, sings and moves well, and has fun making their way through 23 Christmas songs. In addition to those already mentioned, they include Jim Moll, Anne Bauman, Steve DeBruyne, Sarah Brown, Natalie Rose Sevick, Angela Dill, Elizabeth Jaffe, Jared Schneider, Derek Ridge, Brittany Chapa, Alexis Benson, Gavin Burwell, and Adam DeGregorio. Director Steve DeBruyne has sped things up a bit, and designer Matthew Tomich added extra sparkle to the entire affair. Brian Rose and his orchestra sound great, and he has done excellent work with the show’s vocals. Michele Marzejon’s choreography looks great as do Norma Polk’s beautiful costumes and Eileen Obradovich’s props. The dinner is holiday-fare and deliciously prepared by Chef Jarod. Sarah Brown, Natalie Rose Sevick, and Angela Dill do some terrific work as the “Franklin Sisters” — “Jing a Ling” and “Jingle Bells” have never sounded this terrific. Jared Schneider’s tap-infused “Here Comes Santa Claus” alone is worth the admission — but add a terrific dinner, a holiday-cheer filled show that is filled to the brim with Christmas spirit, and a little magic, and you have a delightful night at the theater again this holiday season. Posted by ronannarbor in Entertainment, musical theater, Musicals. 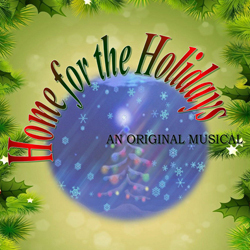 Home for the Holidays, the original Christmas musical written by Steve DeBruyne and Matthew Tomich and featuring a solid cast of 13 returns for its third holiday season at the Dio, the second in its permanent home in Pinckney. I’ve reviewed the show before, so you can check that out with a quick search here. This year’s incarnation has a few minor touchups, yet retains the loving goofiness of a theatre troup performing a holiday-eve show while it’s diva leading lady decides not to perform because her soldier husband can’t get home for Christmas (with strong singing performances by Thalia Schramm and Peter Crist); it’s leading male is grumpy and grouchy for reasons explained later in the proceedings (Steve DeBruyne, winning as always), and it’s supporting male lead has visible nerves and shakes (a terrific Jared Schneider). Draaaama unfolds, and magic takes place thanks to Santa, and well, that’s enough. Forget the story — its the framing device for a delightful holiday-music filled show with singing, dancing, humor, and a Santa-approved ending. Even the hilarious “Christmas Star” would agree — right, Elizabeth Jaffe? Filled with songs ranging the gamut from The Polar Express’s “Believe” to more traditional fare (“I’ll be Home for Christmas”), the pop-rock-country flavor keeps everything moving along under the musical direction of Beth Wondolowski and her three-piece combo, which also includes Leer Sobie and Mary Elizabeth Dee. The cast also includes Cara Manor, Jim Moll, Mary Jo Del Vero, Anne Bauman, Kristin Reeves, Sarah Brown, Ayla Eichenhofer, and at alternating performances Dominc Ignagni and Gavin Burwell. And for the price of admission, you also get a delicious hearty dinner, prepared by Chef Jarod. You can’t go wrong with an evening at the Dio during the holidays — but book early — this has become an annual holiday treat for families and companies alike during the season. Directed by Steve DeBruyne, Choreographed by Michelle Marzejon, Lighting, Sound, and Set Design by Matthew Tomich, Costume Design by Norma Polk, Props by Eileen Obradovich.